Reviews | Coco Lopez Cream of Coconut 15 oz. Whisk your guests off to a tropical state of mind when you prepare drinks with this Coco Lopez cream of coconut. Coco Lopez coconut cream made the very first pina colada in 1954 and still makes the very best! This tropical-tasting treat was invented by blending the real cream of fresh, sun-ripened Caribbean coconuts with natural cane sugar. Craft pina colada cocktails using this original Coco Lopez cream of coconut for the perfect flavor and consistency! This is the best cream of coconut there is. It has the best taste and makes my holiday drink taste just like creamy coconut. I will continue to order in cases! We have worked with different coconut creams for our bar and this one works out the best and from my research webstaurant has the best price. I buy in bulk to get the best price as they last a while and we use it a lot at our bar. We vitamix it with some water and keep it in squeeze bottles. The water and vitamix helps with the flow to expedite drinks quickly. Love this Coco Lopez Cream, we've been using it in Pina Coladas and also a few smoothies and desserts, pretty big can that lasts long even after opening it. We go through a lot of coconut cream for making smoothies so it has to be a good price. This is priced really well and tastes really good. Coco Lopez cream of coconut is very thick and creamy. A creamy consistency is very important when making a vegan ice cream. This is why this is our cream of choice. This coconut cream is a steal at this price! I pay more than double this price from my local brick-and-mortar place, and the taste is just as good. Works great for pina coladas and other coconut-based drinks! The coco lopez cream of coconut is fabulous and very tasty. A great way to make delicious pina colada smoothies. The flavor is so rich and creamy. I have used this coco lopez cream of coconut a few times now and I can easily say that it has become one of my favorites. It is delicious and I use it in some of my drink recipes too. A terrific cream of coconut and great for making our coconut cakes. Great taste and really keeps the cake moist and adds a great flavor. A great bar mixer that is well priced and a great quality. Perfect for making specialty drinks at home. Love the great tropical freshness of the lopez cream of coconut. It is very thick and rich. I love the great tropical taste of the Coco Lopez cream of coconut. It is perfect for adding to our tropical smoothies and very tasty. Coco Lopez is a key ingredient in my family’s traditional Puerto Rican Eggnog. It is hard to find locally so I was thrilled to see it on Webstaurant! A great tasting cream coconut that is perfect for making our Miami vice cocktails. The coconut flavor is superb and we love the convenient small size cans. For authentic tasting pina coladas that your guests will love, you have got to use the coco lopez cream of coconut. It is so flavorful and yummy. I can not get enough of it. cream of coconut is famously used for making pina coladas but i actually use it in place of heavy cream and sugar in some of my dairy free desserts. it works great and tastes great. and obviously makes a great pina colada too! The absolute go to for pina coladas. If you arent using this for your pina coladas then you are doing it wrong. Try this product today! This coco lopez cream of coconut makes the BEST pina coladas! Just follow the directions on the back of the can. Its way cheaper to make your own and you can adjust to you own taste. These even taste wonderful without the rum for a cool refreshing blended drink the whole family can enjoy! I'd never tried cream of coconut before, and I was hoping it was like coconut milk, but this is much sweeter. A little goes a long way. Tastes good though. I love this product! This coco Lopez cream of coconut 15 oz tastes great, is concentrated and thick. I use it a lot in my cooking and also for mixing with drinks. I will buy again in the future. I absolutely love this product! This coco Lopez cream of coconut 15 oz tastes great! Very strong taste of coconut and thick. Great for mix drinks! Coco Lopez is a very nice tasting coconut cream. I take away one star because the can is a bit inconvenient when things get busy. The product needs to be shaken vigorously before use because the lard-looking cream separates from the oil, which is also a bit hard to do in a can. The best tasting coconut product on the market, by far, and the cream of coconut preferred by top bartenders (and me, a rookie) for pina coladas and other rum/tiki cocktails. Delicious and affordable. We attempted to order Coco Lopez through our regular food supplier - after three weeks of them not being able to deliver it, I found that I could order this through Webstrauntstore.com and not only got it within the week but the price, even with shipping, was better. This is the prefect coco nut cream for our pina coladas and quite a few other cocktails that we make at Big Eddy's. Hands down the best cream of coconut around. The bartender uses it to make a wide variety of his cocktails and daiquiris, I just wished I had made a bigger purchase. Love it!!!!!! Great for making pina coladas, very creamy consistency. Contents are very fresh. It could be a little sweeter, I've used a few spoons of sugar to make it taste better. This is a good product. We bake our fresh desserts and this adds additional flavoring to our coconut pies and cakes. We will be ordering more. By far the best Cream of Coconut out there. It's rich, its creamy. I'm use it to make pina collada's and couldn't ask for anything else. Love this stuff. It's great in mixed drinks, smoothies, cakes and when making candy. I like to poke holes in a cake and pour this on. It's so rich no icing is needed. Also good when mixed with butter and confectionary sugar for candy fillings or left thick for icing. Much cheaper than what it costs retail. I have been so surprised with how tasty this stuff is. The taste is truly authentic and you can use it for anything from coconut cakes to smoothies. Tastes great and such a good deal. A few dollars cheaper than what you would buy in the store. This is our go to product for our lime-a-coladas we make for our business. It's authentic and realistic taste have made this drink very popular with our customers. Not to mention, we love the prices for this on Webstaurant. It's almost a full dollar cheaper when you buy it here. I swear by this cream of coconut. It's a great product and very uniform. You can make all kinds of stuff with this form a coconut sauce for ice cream or fruit to a coconut cake that is to die for. This is a great standard cream of coconut. Also, it is really cheap so you can order a few, the only downside is that it's hard to store, but I generally use it up all at once. This is a good item to have for making cocktails and even soup. It is a nice item for thickening a chilled fruit soup and even for desserts. Great flavor and affordable buy. this is a very good product. We use it to make a few different beverages. It is perfect for pina coladas, it adds a great coconut flavor. I ordered this for a baker friend who is well known around these parts for his decadent coconut cakes. I know that he only uses the best ingredients, and I hear that Coco Lopez is the gold standard! Coco Lopez is the gold standard for Cream of Coconut, used in bars and restaurants around the world. There's no beating its creamy, sweet, luscious taste in smoothies, mocktails or the classic Pina Colada. Buy several cans! This is the only brand we will use. We use it in both our Head Hunter drink and Colada drinks, people love it. It is thick and creamy and just the right amount of sweet. We set it on top of our glass washer for about an hour, which makes it easier to pour into bottles. 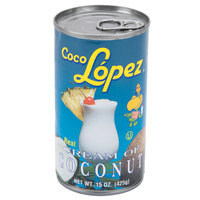 Lopez's the best-tasting coconut cream I have tried and works very well in tropical drinks. If you're a fan of tropical drinks that aren't full of artificial ingredients, this will be your coconut ingredient of choice. Lopez's is specifically called for and is a staple ingredient of many tiki/tropical drinks.